Riviera Maya, Mexico (May 29, 2013) – The “Beyond All-Inclusive, Beyond All-Compare” Grand Velas Resorts, with world-class meeting venues in Riviera Maya and Riviera Nayarit, Mexico are offering a 5% cash back bonus for all new bookings made through August 31, 2013. Valid for group visits from June 1st, 2013 to December 15th, 2015, the 5% cash back bonus is valid for the total cost of rooms, as stated in the signed contract. The bonus cannot be used for private events or Master Account incidentals, or applied towards final payment. The promotion is not combinable with other promotions or special offers and restrictions and blackout dates may apply. Group rates vary depending on travel dates. To request a proposal or for more information on a meetings held at Grand Velas Resorts, please call 1-866-602-5565, email info@velasmeetingsmexico.com or visit the resorts’ comprehensive dedicated meetings website, www.velasmeetingsmexico.com. 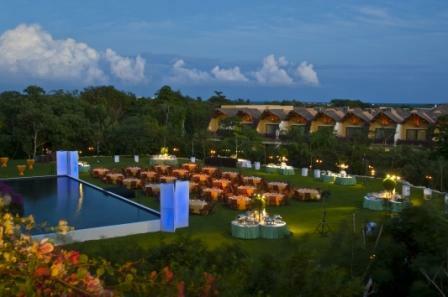 The largest luxury meeting facility in Mexico’s Yucatan Peninsula, Grand Velas Riviera Maya’s luxury meeting facility includes 91,547 square feet of indoor and outdoor meetings and events space that offers an efficient and versatile canvas for creating scenic events and business gatherings. In addition to expansive meeting locations and fully equipped business center with offices, the resort offers top-of-the-line audio-visual equipment, technical support, CD and DVD reproduction and secretarial and translation services. Grand Velas Rivera Maya also features the largest lift in the area suitable for large promotional items. 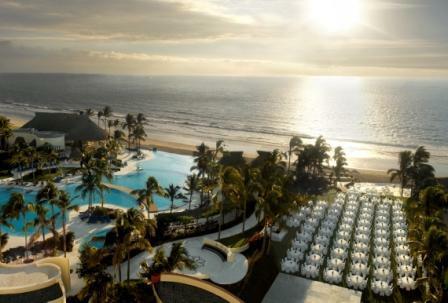 Grand Velas Riviera Nayarit features an excellent convention center suitable for any meeting or event, big or small. The resort features 25,321 square feet of indoor meetings facilities. The Grand Marissa Ballroom consists of over 6,000 square feet and is easily subdivided into five separate rooms, ideal for breakout sessions or individual workshops. The resort’s facilities also include four other rooms ranging from 681 to more than 1,954 square feet that offer several arrangement variations to maximize meeting productivity and efficiency. All meeting rooms offer state-of-the-art audio/visual capabilities, such as high-speed Internet access, video conferencing services, LCD projectors, high-end lighting equipment and simultaneous translation services. Featured in Forbes’ roundup of the 10 Coolest All-Inclusive Resorts, the AAA Five Diamond Grand Velas Riviera Maya, an all-suites and spa resort located five minutes from Playa del Carmen, is the latest and most sophisticated iteration of the ultra-luxury, all-inclusive resort experience. This Leading Hotels of the World designated resort is the preeminent one of its class boasting 491 suites, each more than 1,000 square-feet, in three separate ambiances– premium ocean-front Grand Class Suites with terrace plunge pools for adults and families with children 12 and up, family-friendly ocean-view Ambassador Suites and Zen Grand Suites embraced by the flora and fauna of the Yucatan Peninsula’s jungle. The resort presents a gastronomic tour of the Yucatan, Europe and Asia offering seven restaurants with world-class chefs from France, Spain and Mexico; dedicated butler service for each guest, and the region’s lar gest spa sanctuary at over 89,000 square-feet specializing in signature treatments inspired by ancient cultures from around the world. The spa was named “Best Spa” in the world by Virtuoso and also earned a SpaFinder Readers’ Choice Award. The resort was designed by lauded Mexican architecture firm Elias and Elias and features the sleek and modish interiors that fuse the serenity of the Caribbean with the vibrancy of Yucatan cultures. Grand Velas Riviera Nayarit, an all-suites and spa resort located just 15 minutes north of Puerto Vallarta on Banderas Bay, is a member of The Leading Hotels of the World and a recipient of the AAA Five-Diamond Award. The resort features 267 spacious ocean-view suites. The crown jewel of the resort and a member of Leading Spas of the World, the Spa at Grand Velas features 20 treatment rooms, over 60 spa treatments, gym and exercise room, spa boutique and beauty salon. 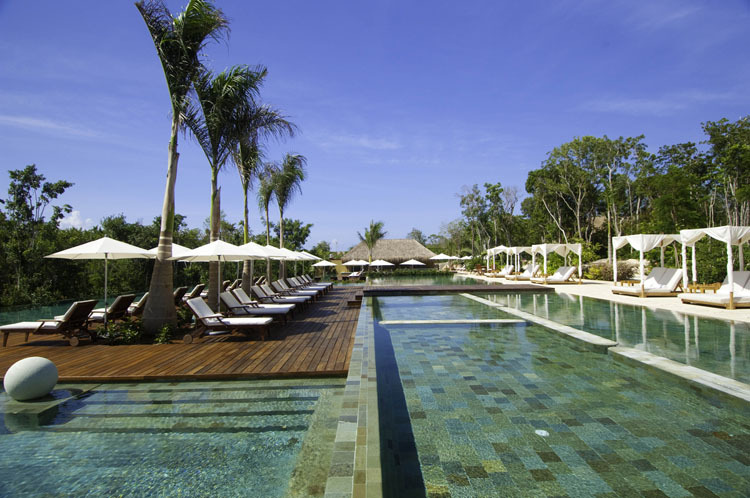 The family-friendly resort also offers tiered three-temperature infinity pools, tennis court, 25,321 total sq feet of meeting space and a Kids Club. Nearby are championship golf courses, numerous options for soft adventure, and the charming town of Puerto Vallarta with its many shops, art galleries and nightlife. 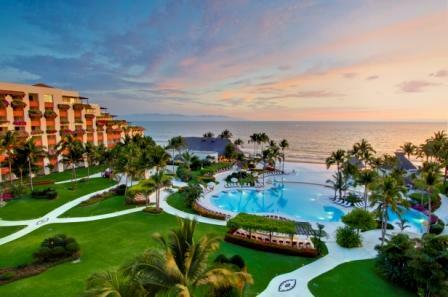 Grand Velas Riviera Nayarit has received numerous accolades within the industry, most recently named one of Forbes’ 10 Coolest All-Inclusive Resorts, as well as a 2013 Best Hotel In Mexico and the #1 Hotel in Puerto Vallarta by U.S. News & World Report.